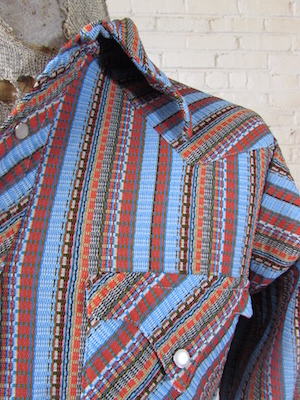 Home > Vintage Western Shirts > All Vintage Western Shirts > (M) Mens 70s Western Shirt! Funky, Textured Stripes in Bright Blue, Orange, Red & Ochre! Mens Vintage 1970s Western Shirt! 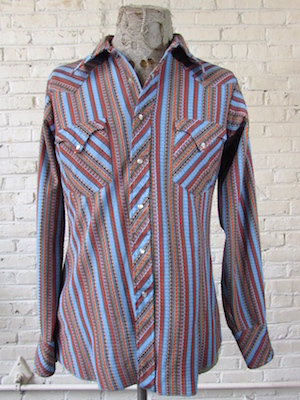 A super funky western shirt with vertical stripes in bright blue, orange, red, ochre, and white. The material itself has a ribbed feeling texture to it. Pearly white plastic snaps down the front with four matching snaps on each cuff. Two pockets on the chest, each with a western style pointed flap and button closure. Shirt has a tapered hem with a long. pointy 1970s collar. No material tag but feels like polyester or a polyester blend.